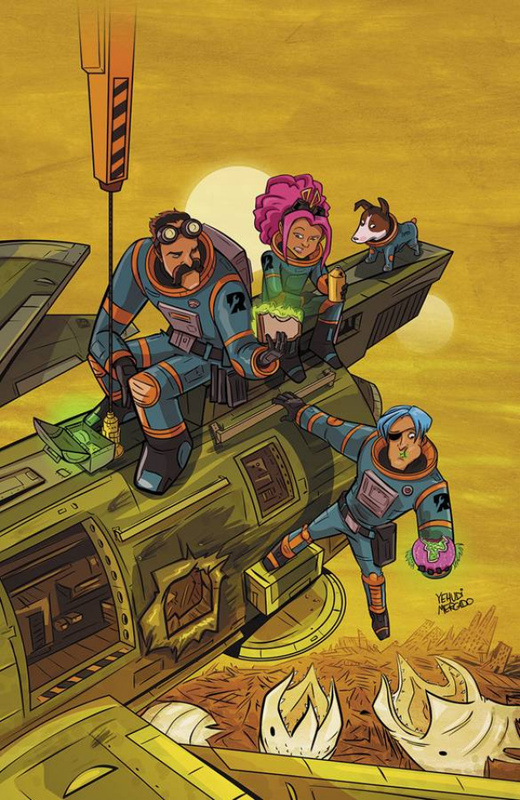 WHY WE LOVE IT: When writer/animator Yehudi Mercado (GUARDIANS OF THE GALAXY: UNIVERSAL WEAPON; PANTALONES, TX) came to us with a dysfunctional family drama about three clones running a rocket ship repair shop, we were already on board. Throw in some spaceport streetand a few alien gangsterstell us when to start our engines! WHY YOU'LL LOVE IT: Did we mention space racing?! With blowsequences from artist Bachan (IMAGINE AGENTS), this series has both action and heart. Fans of STAR WARS: THE CLONE WARS, BRAVEST WARRIORS, and SPEED RACER will want to pick up a wrench and strap in for the ride. WHAT IT'S ABOUT: Primo Rocket used to be the fastest speederin the galaxy, but after a crash that sealed the fate of his spacehome, Rio Rojo, Primo has resigned himself to life as a lowly spaceship salvage yard owner. However, his two "kids"clone Beta, and Beta's genius girlZetaseem to keep out of trouble. When the dysfunctional family suddenly becomes the target of an intergalactic manhunt, the family has to come together to save their home.